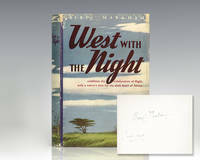 West With the Night is a 1942 memoir by Beryl Markham, chronicling her experiences growing up in Kenya, in the early 1900s, leading to a career as a bush pilot there. It is considered a classic of outdoor literature, in 2004 National Geographic Adventure ranked it number 8 in a list of 100 best adventure books. There are some questions of whether Markham is the real author of her memoir West With The Night. Boston: Houghton Mifflin Company, 1942. First edition, first state with the date of 1942 to the title page of Beryl Markham's classic autobiography. Octavo, original green cloth. Signed by the author on the front free endpaper in the year of publication, "Beryl Markham June 1942." From the library of journalist and publicist Arthur Ronnie with his bookplate below the inscription. Arthur Ronnie acquired an impressive collection of autographs throughout his nearly 70-year career as a publicist in Hollywood, most of which he acquired in personal interviews. His collection focused on American presidents, Hollywood entertainers, explorers and aviators. Near fine in a near fine dust price-clipped dust jacket jacket with some light wear and reinforcement to the verso. Scarce and desirable. Books signed by Markham are uncommon, particularly in this condition. In 1939, three years after she became the first aviator to fly solo across the Atlantic Ocean from London to North America, Beryl Markham moved to the United States where she began writing her autobiography. Published in 1942, the book was favorably received, and revealed in detail the story of her childhood in British East Africa, her career as a horse trainer and bush pilot, and her pioneering transatlantic flight. Ernest Hemingway wrote in a letter to editor Maxwell Perkins: "Did you read Beryl Markhams book, West with the Night? I knew her fairly well in Africa and never would have suspected that she could and would put pen to paper except to write in her flyers log book. As it is, she has written so well, and marvelously well, that I was completely ashamed of myself as a writer. I felt that I was simply a carpenter with words, picking up whatever was furnished on the job and some times making an okay pig pen. But [she] can write rings around all of us who consider ourselves as writers. The only parts of it that I know about personally, on account of having been there at the time and heard the other peoples stories, are absolutely true I wish you would get it and read it because it is really a bloody wonderful book." In 2004, National Geographic Adventure ranked West With The Night number 8 in a list of 100 best adventure books. Boston: Houghton Mifflin. Fine copy in good dust jacket. 1942. 1st. hardcover. 8vo, 294, The notoriously fragile dust jacket has a few small edge chips,rubbing along the folds and a small scrape on the spine; it is price- clipped but the price is shown as $3.00 on the rear panel following the blurb. First American edition, first printing. .
BOSTON: HOUGHTON, MIFFLIN AND COMPANY.. 1942. First Edition. First edition. Very good copy in price-clipped otherwise very good dust jacket. (Bottom edge of cloth chaffed in spots. Small ink stamp at head of front paste-down. Couple slender chips at head of front panel and spine. Short edge tears & light shelf wear to jacket. ) Solid copy of the author's remarkable autobiography. .
Boston: Houghton Mifflin, 1942 Book. Very Good. Hardcover. A Very Good copy that is a bit dusty and lightly frayed along the bottom edge but otherwise tight and square in a Very Good dustjacket that has some spine fading and ligth edgewear and chipping. An uncommon title..
Boston: Houghton Mifflin, 1942. First American Edition. Hardcover. Very good/good. A very good copy in original cloth with black lettering. Mild wear to extremities (including slight fraying to corners of front board, gift inscription dated 1942 on front free endpaper; otherwise unmarked, clean and sound. Dust jacket was at one time folded and has related creases, both vertical and horizontal, as well as shipping to the spine ends and light rubbing and/or creasing at the edges and folds. Original $3.00 price present on front flap (and rear panel). A classic of travel and adventure writing, in which Markham recounts her childhood in Kenya, her years as a bush pilot locating big game from the air, and her pioneering trans-Atlantic flight from London to New York. Described by Ernest Hemingway as "a bloody wonderful book," it is number eight on National Geographic's list of The Hundred Greatest Adventure Books of All Time. London: Harrap, 1943 price clipped DW, hole clipped from fold in flap, also to spine is an Australasian price label with hole clipped through it, head and tail of spine, and corners rubbed with some minor chipping loss, some mild edge creases, generally intact and complete, book has minor foxing to endpapers and closed edges, war era paper stock, 253pp an amazing aviation pioneer, DW by Y. Ellis. First Edition. Cloth. Very Good/Good. Illus. by Y. Ellis. 8vo - over 7? - 9? tall. BOSTON: HOUGHTON, MIFFLIN AND COMPANY.. 1942. Reprint; Second Printing. Hardcover. Second printing. Near fine in price-clipped very good+ dust jacket. (1 1/2"-inch sliver chip at head of front panel of jacket. Slim chipping & shelf wear at head of rear panel. Title faded on spine of jacket. ) Uncommon in either printing. (G) . Boston: Houghton Mifflin, . Tall 8vo. 293,  pp. Blue-green cloth, black lettrng (very minor shelfwear to foot of spine, minor wear to lower corners), w/ d.j. cover art landscape scene of East Africa (chipping w/ minor loss head & foot of spine, price-clipped, old tape repairs to spine, fore-edges), still NF/G- copy. First edition, 2nd printing ($3.00 price on back cover, War Bonds slug on back flap) of this excellent autobiography by the pioneering aviatrix and adventuress out of Africa, and the first to fly east to west over the Atlantic. 1988-01-01. New. Ships with Tracking Number! INTERNATIONAL WORLDWIDE Shipping available. Buy with confidence, excellent customer service! Norwalk, Connecticut: Easton Press. 1989. First Edition; First Printing. Hardcover. Fine, Accented in 22kt gold, printed on archival paper with gilded edges, smyth sewing & concealed muslin joints. Bound In full leather with hubbed spines. Pristine. ; 8vo 8" - 9" tall . 1987-02-02. New. Ships with Tracking Number! INTERNATIONAL WORLDWIDE Shipping available. Buy with confidence, excellent customer service! Easton Press. LEATHER BOUND. B001QGGN1C Brand New. Easton Press, Full leather with gilt lettering and decoration, linen end papers, and ribbon page marker. . New. Boston: Houghton Mifflin, 1942. Pretty nice copy, 1942 on title and copyright pages. Slight spine lean. One owner name erased, another owner name present on first endpaper.. First Edition. Hardcover. Very Good/No Jacket. 1982-09-02. Good. Ships with Tracking Number! INTERNATIONAL WORLDWIDE Shipping available. May not contain Access Codes or Supplements. May be ex-library. Shipping & Handling by region. Buy with confidence, excellent customer service! West With the Night [FIRST EDITION] H.M. Co.
Houghton Mifflin Co.. Hardcover. B003ZBZUXI Missing dust jacket. **Has crinkling** Acceptable Condition. Five star seller - Buy with confidence! . Fair. 2005-04-01. New. Ships with Tracking Number! INTERNATIONAL WORLDWIDE Shipping available. Buy with confidence, excellent customer service! 2007-03-09. New. Ships with Tracking Number! INTERNATIONAL WORLDWIDE Shipping available. Buy with confidence, excellent customer service! 2018-07-25. New. Ships with Tracking Number! INTERNATIONAL WORLDWIDE Shipping available. Buy with confidence, excellent customer service! 2013-02-04. New. Ships with Tracking Number! INTERNATIONAL WORLDWIDE Shipping available. Buy with confidence, excellent customer service! 1983-05-03. New. Ships with Tracking Number! INTERNATIONAL WORLDWIDE Shipping available. Buy with confidence, excellent customer service! 2010-02-06. New. Ships with Tracking Number! INTERNATIONAL WORLDWIDE Shipping available. Buy with confidence, excellent customer service! 2012-09-08. New. Ships with Tracking Number! INTERNATIONAL WORLDWIDE Shipping available. Buy with confidence, excellent customer service! San Francisco, CA: North Point Press, 1987. Illustrated Gift Edition. Presumed First Printing. Hardcover. Very good/Very good. Ward Schumaker. , 261,  pages. Illustrations (drawings and 32 pages of photographs). DJ has slight wear and soiling. In September 1936 Beryl Markham became the first person to fly solo across the Atlantic from east to west, taking off in England and crash-landing in Nova Scotia 29 hours and 25 minutes later. Beryl Markham (née Clutterbuck; 26 October 1902 - 3 August 1986) was a British-born Kenyan aviator (one of the first bush pilots), adventurer, racehorse trainer and author. She wrote about her adventures in her memoir, West with the Night. When Markham decided to take on the Atlantic crossing, no female pilot had yet flown non-stop from Europe to New York, and no woman had made the westward flight solo, though several had died trying. Markham hoped to claim both records. On 4 September 1936, she took off from Abingdon, England. After a 20-hour flight, her Vega Gull suffered fuel starvation and she crash-landed on Cape Breton Island, Nova Scotia. She was celebrated as an aviation pioneer. Derived from a Kirkus review of initial publication: Biography that is refreshing, colorful and unexpected. There is excellent and exciting detail of childhood as daughter of an Englishman who farmed and raised horses in Africa; there is a picture of African friends and neighbors; there is her decision to train race horses -- and then to take up flying, which led to adventure and new friends and finally to the chance to fly the Atlantic. Markham's West with the Night was originally published in the early 1940s and disappeared, only to be rediscovered and reprinted in the 1980s when it became a smash hit. Though Markham is known for setting an aviation record for a solo flight across the Atlantic from East to West-hence the title-she was also a bush pilot in Africa, sharing adventures with Blor Blixen and Denys Finch-Hatton of Out of Africa fame. Hemingway, who met Markham during his safari days, dubbed the book "bloody wonderful." from the Library Journal. Perfection Learning. Hardcover. 0780736834 New Condition. . New. Perfection Learning. Hardcover. 0780736834 Like New Condition. . Fine. West With The Night: The Illustrated Edition. San Francisco::: North Point,,, 1983.. 0865473048. A Fine tight unread copy in a Fine unclipped dust jacket. Beryl Markham, a pioneer aviator, was the first person to fly solo across the Atlantic Ocean from London to North America. In the late 20s after her first marriage failed, she returned to Kenya where she met and befriended Denys Finch Hatton, a well-known big-game hunter and in the 30s(?) lover of another woman writer Isak Dinesen. Karen Blixen was a friend and confidant to Beryl Markham, seventeen years younger. Beryl first stayed at Karen Blixen's home in 1923. When she married Mansfield Markham (the second of her three marriages) in 1927, Karen Blixen lent her house for the honeymoon. In 1928 Beryl, five months pregnant, was invited to dine at Karen Blixen's house with Denys Finch Hatton and the Prince of Wales (later Duke of Windsor). In 1930 Finch Hatton received his pilot's license and bought a Gypsy Moth airplane. He would entertain friends with airplane rides, including Dinesen and Markham. Markham found the experience so thrilling she took lessons and acquired her own pilot's license. In 1942, she published her memoirs which appeared on 13 best-seller lists. West with the Night tells the story of Markham's childhood in Kenya, her unconventional career as a bush pilot, and her pioneering transatlantic flight. Eventually sales began to decline, and the book was forgotten. She died in Kenya in 1986 at the age of 84..
2005-04-01. Good. Ships with Tracking Number! INTERNATIONAL WORLDWIDE Shipping available. May not contain Access Codes or Supplements. May be ex-library. Shipping & Handling by region. Buy with confidence, excellent customer service! Isis Large Print Books. Used - Good. Shows some signs of wear, and may have some markings on the inside. 2018-07-25. Good. Ships with Tracking Number! INTERNATIONAL WORLDWIDE Shipping available. May not contain Access Codes or Supplements. May be ex-library. Shipping & Handling by region. Buy with confidence, excellent customer service! 2013-01-07. Good. Ships with Tracking Number! INTERNATIONAL WORLDWIDE Shipping available. May not contain Access Codes or Supplements. May be ex-library. Shipping & Handling by region. Buy with confidence, excellent customer service! Easton Press, 1989-01-01. Leather Bound. New. Collector's edition. Full leather-bound hardcover, no dust jacket as issued. Beautifully bound in genuine leather, hand selected from individually tanned hides. Sophisticated hubbed design (raised ridges) on spine, stamped with gorgeous accents of 22kt. gold -- a hallmark of fine bookmaking. Textured and shaded, acid-neutral paper won't turn yellow over time. Pages are Smyth-sewn into the binding for permanence (not glued like ordinary books). Endpapers are beautiful satin moire, specially dyed for the publisher. All edges gilded on three sides to enhance the book's elegance. Silk ribbon page marker bound into book. 100% Satisfaction Guaranteed. All items are carefully enclosed with bubble wrap. We ship promptly and worldwide via US Post and will email you a tracking number. Adventure Library. Hardcover. GOOD. Spine creases, wear to binding and pages from reading. May contain limited notes, underlining or highlighting that does affect the text. Possible ex library copy, thatâll have the markings and stickers associated from the library. Accessories such as CD, codes, toys, may not be included. BN Publishing. PAPERBACK. 1607964589 Like New Condition. . Fine. BN Publishing. PAPERBACK. 1607964589 New Condition. . New. Adventure Library, 2002. Hardcover. Very Good. Disclaimer:A copy that has been read, but remains in excellent condition. Pages are intact and are not marred by notes or highlighting, but may contain a neat previous owner name. The spine remains undamaged. At ThriftBooks, our motto is: Read More, Spend Less.Dust jacket quality is not guaranteed. 2012-09-08. Good. Ships with Tracking Number! INTERNATIONAL WORLDWIDE Shipping available. May not contain Access Codes or Supplements. May be ex-library. Shipping & Handling by region. Buy with confidence, excellent customer service! PENGUIN BOOKS LTD, 1988-01-01. Paperback. Used:Good. San Francisco, CA: North Point Press, 1987. Reprint Edition. very good, good. Ward Schumaker. 261, illus., some fading to DJ, sticker residue to front DJ. Illustrated Gift Edition, with 32 pages of photographs chosen from the collection gathered and documented by Ms. Markham's biographer, Mary S. Lovell. In September 1936 Beryl Markham became the first person to fly solo across the Atlantic from east to west, taking off in England and crash-landing in Nova Scotia 29 hours and 25 minutes later. WEST WITH THE NIGHT: POSTER. SAN FRANCISCO: NORTH POINT PRESS.. 1987. Photograph. Promotional POSTER. (17" X 22") Fine on a single high-gloss printed sheet. Set against a green background are several black & white photographic images of Beryl Markham. Suitable for framing. (B) . Virago Pr. PAPERBACK. 0860685411 New Condition. . New. North Point Pr. Hardcover. 0865473048 New Condition. . New.